Bands of waits appeared in British cities during the Middle Ages. Employed to sound the hours on wind instruments, they later developed more varied activities, entertaining royalty at banquets, for example, and townsfolk on days of rejoicing. The original Oxford Waits performed in the reign of Elizabeth I and reached their heyday in the 17th century - the era of the English Civil War - playing on throughout the Commonwealth and Restoration periods. Professional musicians, they supplemented their income by other means; some ran alehouses and gave dancing lessons in the city. On civic occasions they played at 'Penniless Bench' at Carfax, wearing handsome livery cloaks and bossed silver badges. 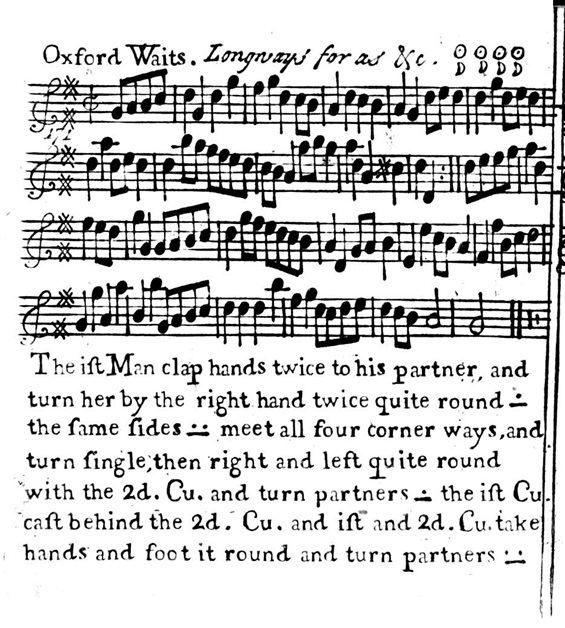 A country dance tune called the Oxford Waits has survived from the early 18th century - it is a cebell or English gavotte and evidently dates from the latter days of Oxford's waits band which appears to have fallen into decline around 1712. When the Duke of York was proclaimed King James II his accession was greeted in Oxford by a colourful parade detailed by the diarist Anthony à Wood in his entry for February 11 1685. Claret, he reports, ran from the fountain or conduit at Carfax as the scarlet-clad mayor and aldermen proceeded with the mace-bearer up the High Street amid stave-bearing marshalls and constables. Drummers and trumpeters were among them too, led by four wind musicians wearing livery cloaks with silver escutcheons around their necks riding abreast, on horseback, and playing bareheaded. These four were members of the Oxford Waits, the official musicians of the city. Waits bands flourished in towns and cities across the face of Britain at this time. Emerging during the Middle Ages, they had civic duties which involved keeping night watch; by sounding the hours on loud wind instruments as they passed through the streets they reassured citizens that all was well. Among their other activities, they entertained distinguished visitors at banquets and townsfolk on days of rejoicing such as the holidays of the king or queen. Oxford’s waits may have existed in the mediaeval period, but before Tudor times evidence is tenuous and the subject requires research. Records for the reign of Henry VII, however, indicate that Oxford already possessed two bodies of musicians; the town waits and the university musicians. A Bodleian manuscript reports that in 1501 a musician named William Jãnyes came to Oxford and was forbidden to play by the town waits unless he would perform with their group. The stranger replied that he had already entered a contract with the university musicians to play for them; John Huskinson, one of the university musicians verified his story. A clearer picture of waits activities appears in the reign of Queen Elizabeth. Reference is then made to Oxford ‘Wayts’ in the Council Acts for 8th October 1577, when musicians George Ewen and George Bucknall are recorded handing over their escutcheons, or badges of office, to the council pending the next time they should be needed. The name of George Bucknall recurs in the Council Acts on 14th September 1588 when he is again appointed a wait, this time taking charge of three escutcheons brought in by a Mr. Gybbons. This was William Gibbons, the father of the great composer Orlando Gibbons and a fascinating figure in his own right. Evidently a musician of some accomplishment he seems to have spent a lifetime moving between the waits’ worlds of Oxford and Cambridge. Born about 1540, William Gibbons was living in Oxford before March 1566 when he moved to Cambridge. The following year he was appointed a town wait in that city and he went on to lead the Cambridge Waits, as well as running an inn and giving tuition as a dancing master. In 1583 William Gibbons returned to Oxford where he was admitted a freeman and took nine apprentice musicians. Something of his range of skills is revealed by the fact that when they completed their term Gibbons was required to give his apprentices instruments which included sackbut, cornet, treble viol and treble violin. The year of his return to Oxford was an important date for William in another respect, for his son Orlando was born in that year, and baptized on Christmas Day - 25 December 1583 - at St Martin’s Church at Carfax in Oxford. William Gibbons seems to have become leader of the Oxford Waits soon after his return to the city, taking charge of their three escutcheons. By the Council Act of 14th September 1588 the band was expanded to five; Gibbons was required to make an additional escutcheon at his own expense, and George Bucknall was required to make another. Only a year or so later William Gibbons upped sticks again and moved back to Cambridge under slightly mysterious circumstances. In a dispute which later broke out in Cambridge it was alleged that William was ‘banished oute of Oxford for his evell behaviour’ and that he and his apprentices were ‘whipped oute of Oxford where he dwelte.’ There is a suspicion that he absconded with the Oxford Waits’ escutcheons. After he went back to Cambridge there appears for almost 20 years (well after his death) a note in the Keykeepers accounts that the City of Oxford is owed the escutcheons by Mr William Gibbons. Subsequent head waits in Oxford had to buy their own scutcheons and hand them in when they left office. Certainly he seems to have been a fiery character. A feud between William Gibbons and a Cambridge university wait named William Byrd led to a fight by a churchyard wall in which Gibbons punched his opponent and broke his shawm. Be that as it may, it is known that on his return to Cambridge in 1589 or 1590 William Gibbons rejoined that city’s town waits, entered the Cambridge university waits and was landlord at the Bear inn. He died at Cambridge in October 1595 and was buried at Holy Trinity Church. Back in Oxford George Bucknall headed the Oxford Waits; in 1588 five badges were placed in his charge, and he was required to sign sureties for their redelivery in the event of the mayor or any of his successors demanding them. Bucknall, it should be added, was granted the freedom of Oxford on 24 November 1596 at the same time as two other musicians, Leonard Maior and John Stacy. Leonard Maior seems to have been a lutenist, because he is known to have had five apprentices in the period 1601-19, some of whom were to receive a lute on completion of their term. John Stacy is known to have possessed a bass viol at his death in 1627. The simultaneous granting of freedom to the three musicians makes it possible to speculate that Maior and Stacy were fellow waits of Bucknall in 1596. Council acts show that it was common for a musician to be offered his freedom on the day he took up waits duties, the usual stipulation being that he paid the officers’ fees and contributed a bucket to the council for fire-fighting. On a single day in 1628, three musicians were simultaneously made waits and freed, as shown below. This was a significant privilege, offering opportunities extending far beyond their ceremonial duties. Once accepted into the waits, musicians could earn good money by exploiting their sway over music-making. But membership did not come cheap. On 11th May 1603 John Baldwin, musician, was made a freeman and accepted into the Oxford Waits on condition that he provided a silver escutcheon worth 20 shillings at his own expense, and that he undertook to leave the badge to the city after his death, or on moving from Oxford. This was to become a standard stipulation. If there was work to be found in the colleges, there was more in the alehouses - key venues for popular music-making in the 17th century. In the year after becoming a member, John Baldwin took out a licence for the Bell tavern. Many other Oxford Waits would also open ale-houses in the city. The waits of 1628 numbered six musicians: John Baldwin the elder, John Baldwin the younger, Richard Burren, John Gerrard (or Jarrett), Phillippe Colledge (or Golledge) and Sampson Strong. Three of them became licensed ale-house-keepers after entering the waits: Baldwin the elder, Burren (1631) and Gerrard (1629/30). The chronology is important. Oxford’s tavern-keeping waits do not appear to have been landlords with a penchant for music, but rather musicians who opened alehouses to help them earn a living wage. Privileged as they were, the Oxford Waits did not possess sole performing rights within Oxford University. The pedigree of the university’s own band of musicians goes back at least to 1501 as has been shown above. Early in the 1630s the vice-chancellor accepted a petition from a body of musicians led by John Gerrard that they should be allowed to form a new group with rights to play in colleges and halls. They described themselves as ‘privileged men musicians and teachers of Musick to many Gents in Collidges & Halles in ye universitie of Oxon,’and were looking for official patronage. The proposal was accepted and a body of university musicians was formed, which included a number of apprentices. One of the latter, Thomas Curtis, an apprentice of Gerrard, would later become assistant organist at Magdalen College. Another, Francis Jones, was employed by the first professor of music. Doors opened to the university musicians, it seems; and there was money to be made too. Besides continuing to give personal tuition to ‘many Gents’ they would play at the lucrative music nights. In 1636 the university musicians were hired to perform at royal plays staged in Christ Church when Charles I and Henrietta Maria visited Oxford. Much of the music for the plays was composed by William and Henry Lawes. Among Oxford musicians, John Gerrard emerges as a busy and interesting figure, performing for the city and university alike. It appears that he was born at Thatcham in Berkshire and took up residence in Oxford at St Michael’s parish. Gerrard was admitted by the university as a 'privileged person' in 1624-5. This was a status granted to certain Oxford tradesmen and college servants which allowed them to claim the privileges of the university and be exempt in certain respects from the jurisdiction of the town. Besides running an alehouse and performing his dual waits duties for city and university, Gerrard also owned a music shop where he sold instruments. The instruments were valued together at £6 13s 4d. Gerrard was also in possession of music books valued at 15s. which has led one authority to suggest that he was selling music as well as instruments. However the books do not appear in the inventory of the shop. They were probably his private possessions. At Carfax the waits played on the roof of Penniless Bench, a recessed bench first used by beggars which later became an assembly point for the city council. Sometimes a special gallery was erected for the musicians. In 1633 we find the musicians on strike, complaining that the city gave them no allowance for playing on the king’s holidays or the mayor’s return from London, and had moreover abandoned its old custom of giving them ‘Wyne and Cakes’ at Penniless Bench. Grievances were settled, however; the allowance for wine and cakes was restored and it was agreed that the waits be supplied - out of city funds - with handsome livery cloaks (though still no regular allowance). Additionally, a new ruling was introduced in the council acts of 21 May 1638 to the effect that membership of the waits was only allowed to those who had served a proper apprenticeship to a freeman musician of the city. Like other waits bands, Oxford’s city musicians were expected to provide loud music on wind instruments. The ancient mainstay of Waits everywhere until the end of the 16th century was the shawm, or, in its more evolved form, the hautbois, or hoboy, usually with sackbuts taking the lower parts. Anthony à Wood specifically refers on one occasion to the Oxford Waits providing ‘wind-musick of houtbois’. Other characteristic wind instruments were cornet, curtal and lisserdine. But the string instruments found in the possession of the Oxford Waits, William Gibbons and John Gerrard (and the possible waits Leonard Maior and John Stacy), make it clear that for indoor entertainments and private functions they provided more than wind music alone. Many waits elsewhere were in possession of non-wind instruments at their demise. Edward Jefferies senior, a member of the Norwich Waits, left at his death in October 1617, a treble violin, another violin (of unspecified size), treble and bass viols, a bandora, an old lute and two other unspecified instruments. Thomas Girdler, a York Wait who died in November 1640, left a bandora , a treble violin, a tenor violin, and a kitt (a small fiddle or rebec, often carried by dancing masters). The bandora’s presence in the inventories is interesting. Wire-strung and used for strumming chords it often accompanied singers, and also featured in broken consorts where strings and wind mixed. Waits everywhere exploited varied talents and multifarious instruments to earn their living. The English Civil War had a massive impact on Oxford, which was for three years the royalist capital of Britain. Charles I arrived on 29 October 1642 and from then until his surrender in June 1646 the city served as his military headquarters as well as the seat of his court and parliament. University life was disrupted as colleges were converted into arsenals, powder magazines and artillery parks. The Law and Logic schools became granaries. Cattle were penned in the quadrangle at Christ Church. Some of the great names of early English music had received their degrees at Oxford; John Dowland and Thomas Morley in 1588, and Thomas Weelkes in 1602. During the Civil War, the music school closed down (not re-opening till 1657) and it is likely that the waits’ duties were suspended too, for they do not feature in the council acts during this period. That some public music-making went on is beyond doubt, however. In 1644 Oxford succumbed to a disastrous fire which a Puritan observer, Nehemiah Wallington, attributed to the hand of Providence. ‘At the last Lord’s day in the morning, some of the soldiers had appointed a merry meeting at a fiddler’s profane taphouse near the Red Lion by the Fish-market, with music, drink and tobacco, one drinking an health to the King, another to the next meeting of Parliament. Thus by drunkenness, music, scurrilous songs, cursing and swearing, profaning God’s holy day. About three o’clock in the afternoon the fire began to appear, which by the just hand of God hath burned about 330 houses’. Was that ‘fiddler’s profane taphouse’ run by one of the waits? Given their tavern-keeping and their sole performing rights it is not wholly implausible. It has to said, though, that Oxford boasted a multitude of unlicensed ale-houses in the 17th century, and no doubt its share of unlicensed fiddlers too. The Oxford Waits resumed their official duties under the Commonwealth, receiving their cakes and wine by the pint when they played at Penniless Bench. The interregnum was by no means as joyless an era as sometimes asserted. It was, in fact, under Cromwell’s Protectorate in 1651 that John Playford published the nation’s first great collection of country dance tunes, ‘The English Dancing Master,’ which proved a popular bestseller. Oxford under the Stuarts had been famed for its dancing schools, especially the Bocardo in Cornmarket Street, and they flourished under the Commonwealth too. A vintner named Thomas Wood had a school at the Salutation tavern in the High Street; and in 1652 his ex-apprentice John Newman set up a rival academy in Ship Street. In 1657 the diarist Anthony à Wood took violin lessons from another dancing master, William James, who taught at a school outside the North Gate. Wood received violin tuition from three different musicians under the Commonwealth. The first was a master of music named Charles Griffith, who gave him instruction in September 1653 and who he describes as ‘one of the musicians belonging to the city of Oxon.’ The inference here is that Griffith was one of the Oxford Waits. The second violin teacher was John Parker, one of the university musicians. 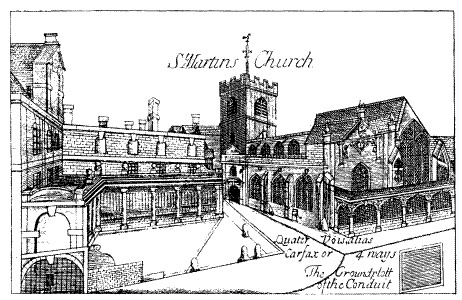 He used with Wood to attend some lively music meetings held in the 1650s at the house of a former St John’s organist named William Ellis who had lost his job when Cromwellian officials took over the city (organs and choirs were two things the Puritans did object to, being associated with high church service). Ellis’s response was typical of an Oxford musician; he took out a licence as an ale-house keeper, and renewed it until his organ post was restored in 1660. People took their music seriously under the Commonwealth - the council no less than the gentlemen-scholars. When young John Davis was admitted to the Oxford Waits in September 1659, it was only on half pay, it being alleged that he was ‘not at the present a sufficient artist nor soe well instructed as to play his part in the consort’. Only after a year’s probation was he to be granted equal shares with the other five waits. John Davis, however, went on to be a stalwart of the band and appears in the record books as yet another musician/ale-house keeper; he was landlord at The Goat’s Head in 1690. The Oxford Waits perhaps had their heyday in the early years of the Restoration. In October 1661 they numbered no fewer than eight musicians, all sharing equally in the ‘profits and advantages that shall come to them as the Citty musicians’. Sampson Strong was still among them, now accompanied by his son William Strong, John Davis, Francis Taylor, William Hilliard, William Garnet and two musicians from Abingdon, James Stokes and John Evans. This was not the only time that an earlier ruling was waived to permit the waits to draw on talents from outside the city. In 1672-3, when they had dwindled to four musicians, two new members named John Foster and Robert Winsloe (or Winston) were brought in from Gloucester. Francis Taylor was spokesman for the ‘Citty Musique’ in 1673 when the waits successfully petitioned for the two new members. It was now agreed that if the waits should make up their number to ‘six able musicians’ they would be given an annual salary of 40s. a head and be given liveries and silver badges to a total value of £20. These would be reissued every three years provided they gave a bond to live in the city and leave their badges to the city on their deaths. Furthermore their sole performing rights were restated: ‘it is agreed that to give encouragement to the City waits they shall be “owned as the Citty musitions.” and all other common minstrels or musicians (the University Musick excepted) shall be prohibited and punished as vagrants according to Statute, if they play in any public house within the City or suburbs except at the Act or the Assizes’. The new salaries represented a real advance for the waits, but no gravy train. Francis Taylor himself seems to have been hard up, for in the same year the city grants him £2 ‘to buy him an instrument’. And in 1683, we find the same musician asking the city to pay his creditors out of his Waits allowance. The waits were out in full force in November 1677 when the Duke of Buckingham came to visit Oxford. The council acts dwell at length on the lavish reception accorded him at Penniless Bench by the mayor and aldermen clad in their scarlet gowns while the waits played their music. A banquet was held for his Grace that night at the private house of a Mr Langstone, near Carfax, where a great table covered with damask groaned under the weight of ‘all manner of fish and fowle as could be got for mony Round the Country’ to say nothing of plentiful wine and ‘sweetmeates wett and dry togeather with tarts, Gellies, and all other things suitable.’ The waits provided music for the entire time that the Duke was in the house. Alderman Townsend must have beamed with special satisfaction as the waits appeared in their handsome livery, for he had furnished the cloth for their garments. The price was £17 14s. 7d for five waits cloaks plus Alderman Harris’s pensioners’ gowns. Three years later, following a visit of the Court to Oxford in 1681 Alderman Townsend again presented the council with a bill: ‘for the City waits for their livery cloaks, £17 1s. 4d’. This was expensive cloth; the tailor, Mr Streete, charged much less for his work on the garments - a modest £1 10s. 0d. New cloaks were issued up to 1712, but afterwards no further mention is made of the Oxford Waits in the council acts. The waits, it seems, still existed in some form at this time. They also left a legacy from this late period in the form of a tune called ‘The Oxford Waits’. It appears in two mid-18th century collections of country dances, complete with instructions (‘The 1st man clap hands twice to his partner’, etc). Town bands often had melodies named after them - the famous ‘London Waits’ appears, for example, in the 1665 edition of Playford’s Dancing Master; the York Waits had a hornpipe and the Warrington Waits a minuet named after them. Were these, as some have suggested, the ‘signature tunes’ of the bands? It is doubtful, especially in the case of ‘The Oxford Waits’. The tune is a cebell - a distinctly English dance, much like the French gavotte but slightly quicker. The sprightly melody must have been composed at the end of the 17th or beginning of the 18th century, the time of the cebell’s popularity. It is too late a piece to have been played during the waits’ heyday, and too dainty and complex to have furnished hautbois players with a strong theme tune. More likely it was composed as a tribute to the Oxford Waits, or it was simply a piece which was noted from the repertoire of a band which had played an important role in the civic life of their city. Bodl. MS. Twyne-Langbaine, iv ff 105-107. Council Acts. Apprenticeship records suggest he was born Sampson Stark and adopted the surname Strong as an alias (Fleming). John Baldwin the younger was apprenticed to his father in 1610 (Fleming). Council Acts. An entry in the chamberlain’s accounts for 5th November 1658 itemises ‘a gallon of sack and a gallon of clarett for the Bench and the officers and musicians each a pint’, £1 8s. 0d. ; bread, cakes, bonfire and sermon the same day, £3 0s. 4d. He had been an apprentice of John Gerrard (Fleming). J. Johnson, A choice Collection of 200 Favourite Country Dances (c.1751) and Daniel Wright’s Compleat Collection of Celebrated Country Dances, vol 1 (no date). I am grateful to Malcolm Taylor, librarian at the English Folk Dance and Song Society, for locating them.